Transesophageal echocardiography, or TEE, is a special echo technique that your physician may request. During a TEE, the transducer is not placed on the chest but is swallowed by the patient. The probe is about the width of an average index finger but is very long. The probe is flexible and the tip can be manipulated using controls on the handle. 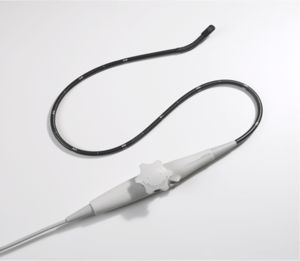 The tip of the probe can move forward, backwards and to each side to obtain the best image of the heart as possible. The special conductive gel is still required so the probe will need to be coated with a thin layer. The conductive gel also serves as a lubricant to ease the passage of the probe into the esophagus. numbing medicine wears off. The TEE probe can be irritating to your throat as it twists back and forth. Fortunately, even the sore throat is relatively uncommon. TEE uses the same principles of sound and Doppler that the transthoracic echocardiogram (TTE) as described in the earlier post. But why would your physician order a TEE instead of a TTE? Have you ever tried to listen to a conversation in another room of your house? It is difficult to hear great distances and through walls. Now that you we understand that echocardiography is based around sound, you can imagine that it is far more difficult to listen though skin, fat, muscle, lung tissue and just to take a picture of the heart. The heart’s valves and atria (the reservoir chambers) are located very far from the optimal imaging windows for the standard echo. TEE is most commonly used to better evaluate the heart valves particularly when trying to decide whether surgery to fix is appropriate. Other common uses include assessing the aorta size or to get a better determination of the heart’s anatomy if the TTE pictures are inconclusive. One of the commonest indications for TEE is to look for blood clots which can cause strokes. Patients with abnormal heart rhythms such as atrial fibrillation or atrial flutter may require this procedure before being brought back to a normal rhythm. If you do have a blood clot, the jolt of being returning to normal rhythm can dislodge any clots that are present. I am a noninvasive cardiologist at the University of Alabama at Birmingham specializing in multi-modality cardiovascular imaging and preventative medicine. My training was primarily at Baylor College of Medicine in Houston TX and the National Institutes of Health in Bethesda MD. This entry was posted in Julian Booker myHeart Blog and tagged ablation, aorta, atrial fibrillation, atrial flutter, cardioversion, Doppler effect, Echocardiography, health, heart valve, heart valve disease, Julian Booker, regurgitation, Stroke, TEE, Thrombus, tia, TOE, transesophageal, transoesophageal. Bookmark the permalink.